We’re accustomed to seeing elaborate maps of fantasy worlds in books, but the plan of a single building or room can tell you just as much about how a character lives and about their world as a whole. Or about how you used to live, when you look back on your journal a few years from now! 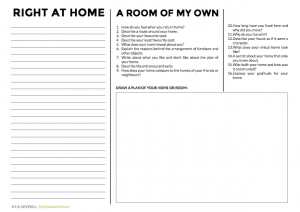 Spend some time to fill in this worksheet and consider what your home reveals about you or your character.